The Ridge 1-3/4 in. Satin Nickel Knob features a round shape. This knob has a premium satin nickel finish that complements many types of decor. Hardware included for ease of installation. The Amerock BP29340ORB Candler 1-1/4in(32mm) LGTH Knob is finished in Oil-Rubbed Bronze. The Candler collection is distinctively elegant, with strong lines and soft curves that blend a touch of femininity with enduring class and timeless character. The Oil-Rubbed Bronze finish is a rich, dark brown old world finish with striking light and dark accents. The Amerock BP1581WN Inspirations 1-5/16in(33mm) DIA Knob is finished in Weathered Nickel. Clean, classic lines in a casual relaxed style, Inspirations is designed to compliment any dicor. Weathered Nickel is a brushed, textured accent that adds dimension to the silver tones of Nickel while accenting the intricacies of each design. The Amerock BP1586WN Inspirations 1-5/16in(33mm) DIA Knob is finished in Weathered Nickel. Clean, classic lines in a casual relaxed style, Inspirations is designed to compliment any dicor. Weathered Nickel is a brushed, textured accent that adds dimension to the silver tones of Nickel while accenting the intricacies of each design. 1-3/4 Ridge Knob, 1 per pkg The Ridge 1-3/4 in. Satin Nickel Knob features a round shape. 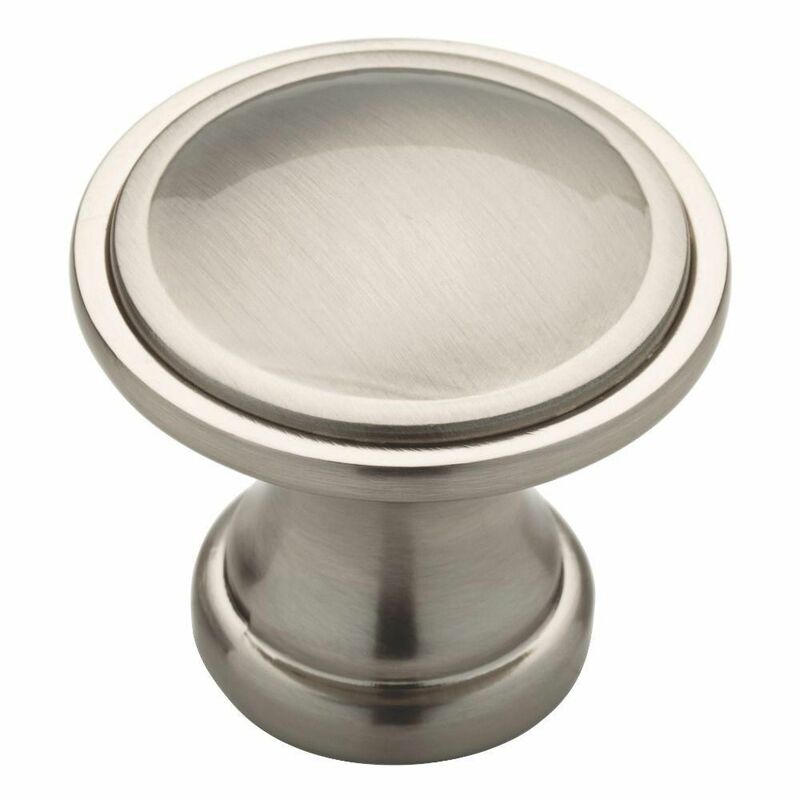 This knob has a premium satin nickel finish that complements many types of decor. Hardware included for ease of installation. 1-3/4 Ridge Knob, 1 per pkg is rated 4.8 out of 5 by 8. Rated 5 out of 5 by Roberta from They are perfect.... They are perfect. Rated 3 out of 5 by Mamamia from Bigger in size than I thought. Returned it. Bigger in size than I thought. Returned it. Rated 5 out of 5 by Spang from Great closet knobs Great product for the money. Better than actual closet knobs. Rated 5 out of 5 by Sunnygal from Substantial classic knob The drawer knobs on my dresser fell apart & I needed to replace them. The size of the knobs the store carriesin stock are for cabinets, not furntiure like a dresser, so I had to special order these knobs. They were delivered to my home quickly & exceeded expectations. They are a heavy piece of metal, the hardware that came with them for installation was heavy duty & they installed in minutes. I don't think the screws will strip out like on my old ones. They look great! A nice update to my old dresser! Rated 5 out of 5 by chase from nice looking, comfortable to use It was not easy to get knobs/pulls that not only look good but are comfortable to use. This knob is deep enough to get your fingers behind it and use. Rated 5 out of 5 by Aaron from Quality Knobs These are solid, nice looking knobs that feel good in your hands. Perfect for bi-fold closet doors. Rated 5 out of 5 by dakota from Just what I wanted, looks great! Used on french doors in den rather than a latch set.